Caspar is truly becoming an engaged community, a venue for collaboration and sharing of interests. We are engaged in the issues of preserving our heritage, history, natural resources, and creating a community that is fully sustainable and vibrant. The Community Center has become a melting pot for diverse community activities including community forums, educational events, great entertainment, holiday celebrations, dinner parties, yoga, pilates, and dance classes, weddings and wakes. Thanks to community involvement, after only nine months the Community Center is almost self-supporting. With the ongoing support of so many in the community who have made pledges of $10 a month or more, we only lack about $400 a month over the next six to twelve months until we are self sustaining. So if you're thinking about a holiday gift to the Community, please consider signing up to be a donor. And if you're not actively engaged, we invite you to join your neighbors for a community center event. We hope you'll be pleasantly surprised, and energized enough to "become engaged"! "Never doubt that a small group of thoughtful committed citizens can change the world. Indeed it's the only thing that ever has." New College, Oxford, England has a dining hall that was built 350 years ago. Its roof is supported by a series of 40-foot long beams made of brown oak which recently were found to be decayed and in need of replacement. The college authorities contacted a contractor who specialized in this type of work and indicated that they wanted the new beams to be similar to the original ones, preserving the architectural integrity of the building. They were told that brown oak of the needed dimensions was not available anywhere in the United Kingdom. Not wanting to take no for an answer, New College contacted the local Oxford forester to see if this were true. "We've been wondering when you'd ask," said the forester. It seems that when the dining hall was built, the architect went to the person who was then the Oxford forester and asked him to plant a stand of brown oaks, because he knew those ceiling beams would need to be replaced in about 300 years. That story is told by the architect William McDonough, who adds, "That is the way that a culture should function." It puts us in mind of Meridian Green, who has been encouraging Caspar to plan for the next 100 years, and it makes us wonder if we should chide her for short-sighted thinking. Good news for those of us who were thrilled to host the first-ever Bioneers Community Remote gathering in October: the organizers are committed to doing it next year! The effort to inform our community about the work of Bioneers begins on December 2nd with a very exclusive $500 a place gumbo dinner for 14 cooked by activist and actor Danny Glover at Pat Dunbar's spectacular home. Bioneers isn't just for the nobs; it's an effort to find solutions for the problems that afflict our world in "the heart of nature." As members of our Caspar community worked side by side with Belvie Rooks and Marla Greenway to produce the 2002 event, we were amazed by how parallel our goals and means run, and how many values we share. Caspar's 2002 conferees watched morning satellite broadcasts, including Fritjof Capra, noted physicist and environmentalist, who said "The stone age didn't end because they ran out of stones," Capra quipped. "The Petroleum Age will end because we find better ways to get things done." Showing slides of successful bio-remediation projects on three continents, bio-remidiation expert John Todd quipped, "I sometimes feel like a little mammal at the end of the dinosaur age, scurrying around creating a new world without the behemoths even knowing." At the end of the conference, Community Board president Mike Dell'Ara said "This is great stuff! I'm amazed at how few people know about Bioneers. Next year we have to make sure more people can take part in these important conversations." After a very busy September and October, the Center and its grateful manager are experiencing a little welcome break in activity. The Bioneers weekend in mid-October was a stimulating gathering of interested local and beyond residents partaking in thought provoking lectures and workshops. During this weekend we also discovered how nice it can be to "hang out" on the back porch on a sunny afternoon with neighbors sharing in a cup of tea, a snack and some good conversation. I expect to see more of this in the future. Halloween was a blast! Not only the hour and a half of peak excitement, but the weeks of planning and days of building. I just want to say thanks again to the many, many folks who helped make this happen! It was really fun, and judging by the crowds we drew, a very popular Halloween event. On the Saturday after Halloween a group of local ladies, many of whom work at Corners of the Mouth, put on a dance at the center. Not only did they pay for the hall rental, put on a well organized and fun event, then cleaned the hall until it sparkled ...then they donated back to the Center all their profits, $400. To me this is part of the magic that makes this place so special. Thanks so much! Due to Mary Flannery Kraut's and Judy Tarbell's enthusiasm for ping pong, a Wednesday evening has become Open House game night at the Center, from 6:00 p.m. till about 9:00 for ping pong, scrabble, cribbage, games, and socializing with neighbors. Two of our yoga teachers seem to be moving on because a dedicated yoga studio is opening in Fort Bragg. This leaves some serious space available for classes on the weekdays. If you, or someone you know, is interested in renting the facility to teach a class, please ask them to contact me at 964-4997. The next big Community Center benefit will be the New Year's Eve Party with ¡MamboThis! Come at 8:00 p.m for hors d'oeuvres, beverages, and the lighter side of ¡MamboThis! Around 9:00 the dancing will start and will continue till 2003. Your $40 ticket includes finger food (come hungry), a glass of champagne or other beverage of your choice, music and dancing, and the opportunity to share a New Year's Eve to remember with neighbors and friends while benefitting the Community Center. I think this one will be a sell-out. Tickets will go on sale in early December and are NOW available online at CasparCommons.org , and will become available in early December at Out of This World in Mendocino, Tangents in Fort Bragg, or by calling the Community Center at 964-4997. New Years Eve Party will sell out! 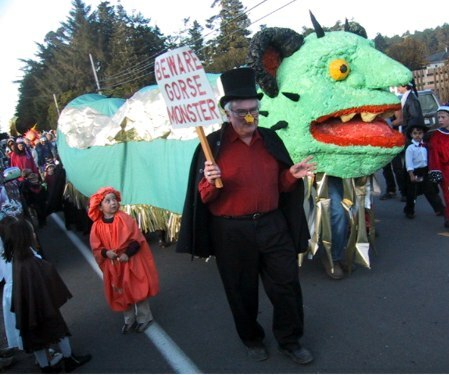 The Gorse Monster rampaged, innocent school children were terrified, adults behaved like children (and were terrified) ...and another fabulous Caspar Hallowe'en passed into legend. This Hallowe'en was the most comprehensive production ever. In addition to a Parade led by Jerry and Susan Juhl and our wonderful Gorse Monster, Dalen Anderson and her crew created a delightfully scary Haunted Schoolhouse, and Lynette Anderson and her crew produced a Kiddie Carnival that was mobbed by young and enthusiastic witches, goblins, and bumblebees. Later in the evening, Oasis and friends recounted ghost stories to round out the evening. Friday evening Holly Tannen presented a Day of the Dead concert of traditional and original music centered around the idea of inviting our ancestors to join us in our community work. Saturday night, "the fun people" held a wonderfully eclectic and diverse event, and then cleaned the place up until it sparkled (see the preceding article). Our Hallowe'en celebration is a wonderful example of Caspar Community "fun-raising," bringing out a spontaneous outburst of volunteerism and shared enjoyment. Few events in Caspar (or elsewhere, for that matter) involve such a broad spectrum of ages, never mind species! Caspar resident and folk music guru Mickie Zekley has offered a world-class opportunity, and plans are already underway to take him up on it. Lark Camp, held at the Woodlands in early August of every year, attracts some of the world's best folk musicians and some of their most ardent fans. After a week of workshops and activities under the redwoods, Mickie thinks many of these musicians and fans would be happy to have a folk music festival to go to nearby. Of course, the rest of the coastal community and folk music fans from all over California would also be invited. Current plans are to start small, with two or four concerts and plenty of free folk activities for two days, Saturday and Sunday the 9th and 10th of August, 2003. If you're a folkie, or know some, please mark your calendars! And look for a list of events in future newsletters. We will be needing help from the community: if you're willing to host a musician or two, please let us know. Generous matching sponsorships from Lark in the Morning and Thanksgiving Coffee make it imperative that we line up the necessary start-up funding before March 1st. If your company or organization can see a way to help, please be in touch. In times of adversity and disaster, our Community Center will likely become our source for emergency medical care, food, water, and information, and so we might as well get started preparing it. In July, we sponsored an American Red Cross Basic First Aid & CPR Class. Brittany Dondanville, the instructor, volunteered her time. Nine people took the class and three others were able to recertify through an exam. The Community Board is working on the requirements and necessities in case the Community Center is needed to care for its neighbors. Future events include a Blood Drive and other classes as needed by the community. The Board needs the help of interested individuals in preparing the center. Seasons Greetings from the Garden! Winter is upon us and the grass is greening up again in Caspar. Some Good Fun is to be had with family and friends to finish out the year right. Why not do an apple tasting over the holidays as a conversational appetizer? Dried goody ornaments are a great treat as well as a good way to eat more fruit and less artificial sugars. Try drying slices of persimmon, red and green apple, and pear in a food dehydrator, strung and hung above the stove or on low heat in the oven. Using a needle and thread you can make loops in order to hang these fine edible ornaments on your tree. It's also a good time for wreath-making. Gather some of your favorite colors and smells of the flexible vegetative sort and let your creativity guide you. Get a good start by wrapping thread, string, or wire around a form made of willow branches, grapevines, or other flexible stuff. How about a halo of foliage for festive wear? For me, this is the season when pruning and sculpting my perennials becomes quiet time to give thanks to the garden that feeds me, my family, and my bird friends. Now is the best time to get your garden ready for bare root plantings. Making grafts in the orchard can be a most interesting education to share with a friend, especially as you watch the plant comes to life again with new leaves in the spring. Larry Spring put in his latest orchard at age 65. It's never to late in life to plant a tree! In Caspar, Nature is such a broad topic! Whenever I try to single something out, I find it's connected to everything else. Ask me about "song sparrows" and I might immediately spin off to the deadly effects of our feral cat population or the use of pesticides (insecticides, herbicides and fungicides). Or I might go off about habitat loss, and how we urgently need to remove non-native invasives and plant more native shrubs, while being careful about tree removals and large disturbances during nesting season. But wait! I digress. What about Nature in Caspar Right Now? The next 3 months is a great time to "bird." Migrations started around late July but many migrators are still in our area and some will overwinter here. Yellow-rumped Warblers, Golden-crowned Sparrows and Fox Sparrows rejoin several other resident species of sparrows and finches. Raptors (Hawks) are still heading south and some of these too will overwinter here, competing with their resident kin until some move on to better feeding grounds. Aside from it being a good time to sort out the sparrows at your feeder, it's likely that the various storm fronts and weather changes will bring in a "vagrant" bird to send some of us racing for our bird books. Birding by ear becomes more difficult now. There is more territorial chipping and all birds have quite a repertoire throughout the year. Some young birds in their first winter are learning how to sing like a 13-year-olds with new vocal chords. It's mushroom season. With our late rains, mushrooms, lichens and fungi are emerging from dormancy and offer a pallet of colors and shapes – a world of wonder in microcosm. Please remember there are Old mushroom hunters, and Bold mushroom hunters, but no Old, Bold mushroom hunters: don't eat unless you're Sure. It's whale watching time – the great Greys are heading southward by our shores as I write this. I'm hoping the Navy Sonar Testing will not give us a more up-close and personal view of these sentient beings. It's tick season too. I'm going to get one of those "Ticked Off" tick removal inventions. I hear they are the best and available at Mendocino Coast Clinics in Fort Bragg. If petroleum was the ruling liquid of the 20th Century, water will surely rule the 21st Century. Regional and global efforts to steal water and send it elsewhere show us that Caspar's small but significant water trove, presently owned by the Caspar Cattle Company but in escrow to be sold to Peter Wells, has great importance as we plan Caspar's future. As we Casparados continue to look for ways to sustain and assure the quality of all life in Caspar, we are reminded again and again that we provide a friendly meeting place for many of the concerns and opportunities that touch the lives of everyone living along the Mendocino coast. The Water meeting on Sunday, November 17, was a textbook example. During the meeting, operators of water systems from Irish Beach to Westport, private and public, met together, talked with each other, and shared their expertise in unprecedented openness. At the conclusion of the meeting, Casparados cast straw votes for three questions: (1) Should Caspar have a Town Water System? -- 17 yes; 0 no; 1 maybe; (2) If there were a Town Water System, would you want to have a hook-up? -- 7 residences and 2 commercial establishments west of the water tanks want hook-ups; 1 residence east of the water tans wants a hook-up; (3) If there were a Town Water System, would you prefer water be purified with ozone or chlorine? -- 9 people voted for ozone; 1 voted for chlorine. If Caspar were to look to existing town water systems as models for ownership patterns, four possibilities were discussed at the meeting: mutual non-profit corporation owned by the users (a model used by two subdivisions and one town); county water district (two towns); a state water district (one town); private ownership (two towns). The existing Caspar water system serves six residences and three commercial establishments and trucks water during the dry season to coastal residences and businesses. Its transite pipes are similar to those in use in other systems. Based on a 1990 study of Caspar water potential and an assumed 200 gallons/day per household, the Caspar Water System could gravity feed water to the proposed houses as well as existing houses in downtown Caspar, and could pump water to houses uphill of the holding tanks. However, everyone agreed that further testing of adjacent wells and the quantity of water in a dry year is essential before making plans for use of the Caspar Water System. A group of interested residents will be looking into funding sources to study the water supply and into ways to create a community-owned Caspar Water Company. If you would like to join in the conversation, please send contact information to water@casparcommons.org . In October, led by our old friend Professor Randy Hester, a teamof graduate students help us conduct a charrette to gather ideas about how we should develop "Caspar from the Center Out." Their first four plans were returned to the board for our comments, and promptly sent back so they could prepare to present their conclusions at our regular December Community meeting, December 8th, 3pm at the Center. The new plans, based on the information and preferences collected from hard-working neighbors who gathered for the charrette, include improved traffic circulation, parking, post office location, and amenities to improve the Community Center as well as its relationship to the people who live right next door and across the street – an important consideration for a community like ours. 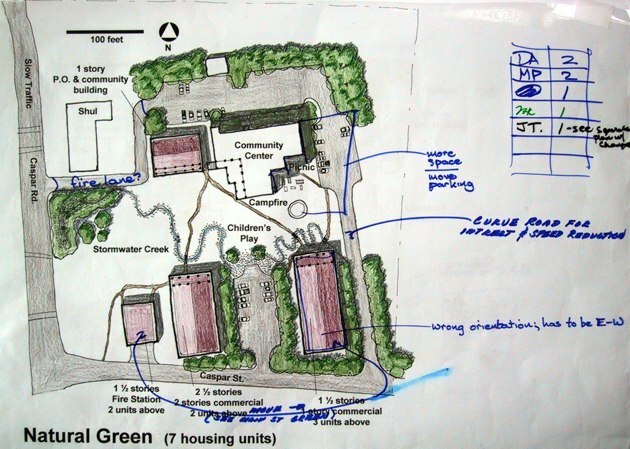 The new plans, based on our input, are bound to contain some surprises – the preliminary plans certainly did! (They can be viewed at CasparCommons.org/Plan/UC2/Charrette.htm) You and all your neighbors are earnestly invited to the meeting on December 8th. All this and the BBC too! Caspar keeps attracting the attention of other communities around the world who want to improve where they live. Many of you saw the recent (August 4th) New York Times article, and so did the British Broadcasting Company. They're so interested in what we're up to that they're sending out a team to do a radio segment on us, starting with the December 8th meeting. Of course we'll feed them at our usual after-meeting potluck – some of the dishes at the November Water meeting were outstanding! – but in recognition of the fact that this crew is doing radio, we're inviting our two singers, Meridian Green and Holly Tannen, and a few of their musical friends, to come along for some playing and singing afterwards. Please come to the party! As you may read in Dalen's article, our Community Center has been breaking even (thanks to a few faithful pledgers!) and bringing good times to Caspar. But now the real work on the Center is about to begin, and we must remember that Caspar is about more than operating a meeting place. Dalen tells us that to get through the slow months of January and February, we need twenty or thirty more pledgers to secure year-round operations this first year. Thinking back to our first events in the old Schoolhouse last Autumn, we've come a long way: restoration of the beautiful floor ("The best floor on the coast," according to many dancers), new wiring, exterior lighting, and north stairway, curtains and shades, draping to improve the sound, a new stove, removal of the cubicles in the south room, a cleaned-up playground, better lighting, bulletin boards, and a repaired roof over the entry. We've been very frugal, and our expenses have been considerably less than anticipated. Up until now, we've been operating the Center "as is" while we await the slow but beneficent USDA loan that will enable us to take full possession of our building and grounds. The loan is set to be funded in late December, and includes funds for the most urgent repairs, such as a new foundation and septic tank. Caspar architect Dan Dickson has been working on the repair planning and bid specification. Bids will be let on the major work to be done when the loan is funded. As we prepare for the next year's activities at the Center, we see a need for another series of work parties to spiff up the bathrooms, build storage cabinets, and ready the grounds for Spring. As we've lived in the wonderful old building, we've also discovered that we also need better lighting for the stage, and a sound system, an enlarged kitchen space, to make it a better, more rentable, venue. Our work continues outside the Center building, as we prepare to include in our plans the town square we expect to gain as a result of our density transfer agreement with the Caspar Cattle Company. In the article Planning Caspar from the Center Out you may read about the newest round of community planning work begun in October to develop this village center "Caspar style" so that it fits and enhances the community without damaging the quality of life. One major change that must be made immediately is relocation of the post boxes, but other issues, such as the eventual placement of a fire house and post office, require a serious planning effort. The opportunity to secure the water is probably outside the scope of community action in the short term, but eventually, if we wish to hold to our plans, we will need to account for that as well – see the article on Water in this issue. This round of planning is likely to be less costly than the first round, and we can look to the county and our conservation partners for help, but Caspar's strength continues to be our willingness to work and give to the betterment of our little community. Your contributions go directly into projects that will make the greater Caspar area as livable as possible. Unlike most fund-raising appeals, we can claim zero overhead: our Community Center and its manager, thanks to your pledges, are self-supporting. Our planning work, and the attention it brings to us from around the world, is a sort of "lifestyle insurance" that would be much more costly if provided commercially. To deliver on the program of planning and preservation that we believe you, our neighbors, expect, we need your help, in terms of volunteer hours, usable equipment and materials, and most useful of all, your donations and pledges. Your contributions to Caspar Community serve many purposes – to demonstrate the viability of careful planning, the beneficial effect on all forms of life of conscious attention to development and preservation, and the community-building challenges and accomplishments achieved through our hard work, gradual and consensual decision-making, and friendly kindness. At this season, we look backward at the many accomplishments and triumphs of another great year in Caspar, and we look forward with gratitude and expectation of even better things to come. Happy Holidays, and a joyous New Year!